RuneScape Gold, OSRS Gold on Hot Sale at MmoGah! Buying RuneScape Gold has a very low ban rate. None of our RS Gold customers has got banned for buying RuneScape Gold so far. Horrible, deceitful people. Avoid at all costs! Looking for identity theft victims! The identity requests were absolutely appalling to say the least. I've been buying currency for online games since 2006, so I'm well aware that sometimes places will require an ID scan/a quick phone call/etc. but this was completely ridiculous. Agent Angelica has joined the chat. [10:41:46]	Angelica: : Hi, Kyle, thank you for contacting us. My name is Angelica. How can I assist you today? [10:48:21]	Kyle: : That’s too much work for a $10 purchase. I’ll take my business somewhere else. [10:48:31]	Kyle: : I’m gonna make a PayPal dispute in a second here. [10:49:47]	Kyle: : And then guess what? The transcript will be sent to "[email protected]" after the chat ends. [10:53:06]	Kyle: : No I can take my money somewhere else though. [10:53:15]	Kyle: : I haven’t received my refund yet like you claimed. [10:54:34]	Kyle: : I’m just gonna call my credit card company, it’s faster. Then I’m gonna look into getting your PayPal froze because you guys are horrible at scamming. [10:54:51]	Kyle: : Also posting a thread on forum sites. Get your business straight. [10:55:11]	Angelica: : sorry for this. The visitor has left the chat. tl;dr- Scammers, and probably preforming identity theft. Asks for information such as utility bills with your name and address on them, a picture of the front of your credit card with the security code, etc. Let me preface this by saying I've been buying currency for online games since 2006, and am well aware of the etiquette it comes with. Sometimes websites will require an id scan/phone call/etc. to confirm your identity and to make sure you aren't using a stolen card/paypal account. I'm well aware of this. These people are deceitful, scammers and almost indefinitely using their website as a front for identity theft crimes. I went in to their live chat and asked if they had some kind of verification service after ordering, and they said no. I ordered $10 worth of gold, 15 minutes later I entered thier live chat. Here is the transcript. Transcripts: If you do not want to wait, please click here to leave us a message. [10:41:46]Angelica: : Hi, Kyle, thank you for contacting us. My name is Angelica. How can I assist you today? [10:48:21]Kyle: : That’s too much work for a $10 purchase. I’ll take my business somewhere else. [10:48:31]Kyle: : I’m gonna make a PayPal dispute in a second here. [10:49:47]Kyle: : And then guess what? 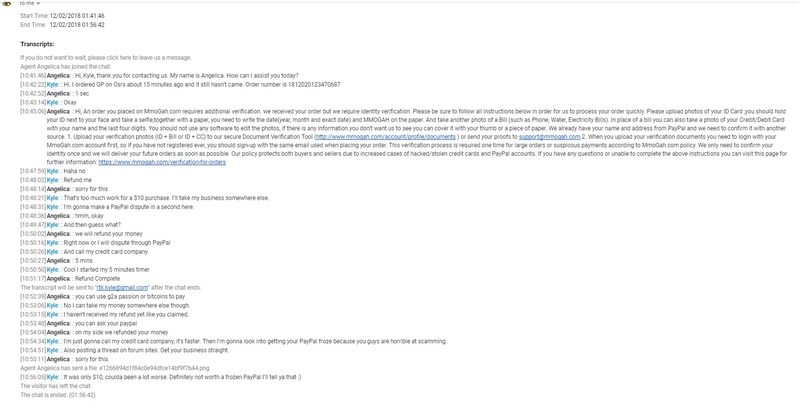 [10:51:17]Angelica: : Refund CompleteThe transcript will be sent to "[email protected]" after the chat ends. [10:53:06]Kyle: : No I can take my money somewhere else though. [10:53:15]Kyle: : I haven’t received my refund yet like you claimed. [10:54:34]Kyle: : I’m just gonna call my credit card company, it’s faster. Then I’m gonna look into getting your PayPal froze because you guys are horrible at scamming. [10:54:51]Kyle: : Also posting a thread on forum sites. Get your business straight. [10:55:11]Angelica: : sorry for this. [10:56:05]Kyle: : It was only $10, coulda been a lot worse. Definitely not worth a frozen PayPal I’ll tell ya that The visitor has left the chat.The chat is ended. Stay away from this scum. Firstly, you wrote that we told you we did not need the verification before you placed the order, we checked all chats, we never told you about that, you must have misremembered or you are just lying here to smear us. Secondly, we ask for the verification just for protecting our money, absolutely not to steal customers' info or money. We had already told you that you can cover the sensitive information on the proofs, not like you said "the security code,etc. ", you are jabberign here. Finally, let us tell you why we ask personal proofs from you with a only $10 order. RS has a higher percentage of dispute than other games and all of your info. seems bad after being checked from our security system, which means, there is a big chance that you will charge back the money after we have delivered it to you, so we must ask you the personal proofs with you even if it is a $0.1 order. We will verify customers with personal proofs everyday, we will refund the full money if the customer would not like to send the proofs and suggest them to use Bitcoin or Payssion, which we don't need the personal proofs, none of them ever left bad review because of that, you are the first one, so stay away from us, neuropathic patientis are not welcomed to our site. [10:41:46] Angelica: : Hi, Kyle, thank you for contacting us. My name is Angelica. How can I assist you today? [10:48:21] Kyle: : That’s too much work for a $10 purchase. I’ll take my business somewhere else. [10:48:31] Kyle: : I’m gonna make a PayPal dispute in a second here. [10:49:47] Kyle: : And then guess what? [10:53:06] Kyle: : No I can take my money somewhere else though. [10:53:15] Kyle: : I haven’t received my refund yet like you claimed. [10:54:34] Kyle: : I’m just gonna call my credit card company, it’s faster. Then I’m gonna look into getting your PayPal froze because you guys are horrible at scamming. [10:54:51] Kyle: : Also posting a thread on forum sites. Get your business straight. [10:55:11] Angelica: : sorry for this. "you are just lying here to smear us." "none of them ever left bad review because of that, you are the first one, so stay away from us, neuropathic patientis are not welcomed to our site." Purchased twice and received it withing 30 mins.